Wanting to have another country stamped in our passports. Our group decided to have a side trip to Johor, Malaysia which is just about an hour's bus drive from Singapore. A large bridge separates Singapore from Johor but there is a very large discrepancy when it comes to the environment. We love Singapore for its clean air and manicured parks and street. On the contrast, Johor is similar to Manila - cluttered and with lots of beggars lined-up on the streets. After spending about an hour in immigration, the group headed to a Muslim mosque to observe how the Malays pray. Then, we headed to a local community there where we had the chance to mingle with locals and visit their houses similar to our own nipa hut. We spent only few hours in Johor and headed back to Singapore on that same day. I haven't brought my digital cam so I have no pics to share. 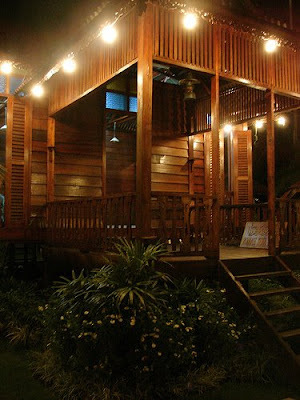 However, this picture of a house from the flicker site of Xhaniff is similar to the house we have visited. Sinilip ko din ang Johor nung nagpunta ako sa Singapore. Hindi mo ba napuntahan yung magandang mosque?